Wreck fishing in the keys is a unique type of fishing that anglers from all over the world come to experience. We have so many different wrecks in the Keys that the hardest part becomes deciding which one’s that we want to fish on any given day! 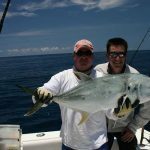 This type of fishing is one that you will generally find the larger fish. The fish that have grown out of their adolescence and are no longer in need of their school. They are large and fast, and are plenty capable of catching their own meal. Also, they are more than happy to give you a run for your money on rod and reel! Although, the solitary fish aren’t the only ones that like the wrecks, there are several different types of fish that live around these massive structures that will gladly come up to the surface for a free meal. In this type of fishing, we will fish the bottom, or will “live-chum” the fish to the surface. 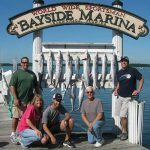 Usually we will have lines on the bottom to target the big Grouper and Mutton Snapper, while leaving out flat lines and kites to pick up King Mackerel, Wahoo, Sailfish or Barracuda. All at the same time we are tossing handfuls of live baits overboard bringing up the Amberjacks, Jack Crevalle, Blackfin Tunas, and Bonita from below. Once they are at the surface, we will bait up the lines with the same live bait, and off to the races we go! It is a technique that is rarely used, but offers up some of the most exciting fishing to be found anywhere in the world. This is a truly addictive method of fishing! Big Amberjacks on the wrecks, Islamorada, Florida. 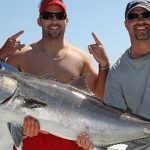 Wreck Fishing Charters, Islamorada, Florida.